Home » Contact Lens » New to Contacts? Extra testing will determine which contacts will best fit your eye. Contact lens-related tests are done in addition to the routine eye examination. These are procedures that only need to be done for contact lens wearers, not for patients who don’t wear contact lenses. 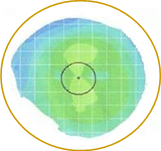 Corneal topography is one of the many essential tests done for contact lens wearers. 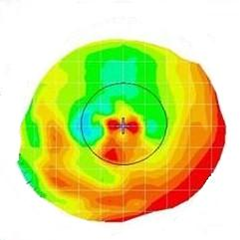 With this computerized data we can more accurately fit contact lenses and detect undesirable changes of the cornea caused by contact lens wear. In another test, a microscope is used to examine the fit of the contact lenses and the health of the corneas. Additionally, prescription measurements are taken which are different for contact lenses than for glasses. As a contact lens wearer additional tests are done for you that are necessary to make sure your eyes are healthy, that your lenses fit properly, and to ensure that you are seeing as well as possible. Contact lens professional fees are for the extra testing and time taken by the staff and doctor each year to properly evaluate your contact lenses. Initially, contact lens patients require a more extensive evaluation. This fee, between $72 and $112, depends upon the type of contact lenses needed. After you have become an established contact lens wearer in our practice, the fee is reduced to between $42 and $57 annually. The evaluation fees include all contact lens instruction, follow-up appointments, trial lenses and a starter kit of solution. Doesn’t my Insurance cover contact lens professional fees? It depends on your plan’s coverage. Most insurance plans cover a routine eye exam which determines your glasses prescription and evaluates your eye health. Contact lens services are separate procedures that often are not covered by insurance.